How do I set up Candidate Ratings? How do I set up Candidate Rating? Before you get started, it’s a good idea to have a thorough understanding of what ratings in JobScore are all about and how they can benefit your hiring process. Check out this article on ratings to learn more. From the ADMIN tab menu, select Candidate Ratings. This will bring up the Admin: Candidate Ratings page, displaying the current Rating Type selection as well as any Ratings that have already been created. 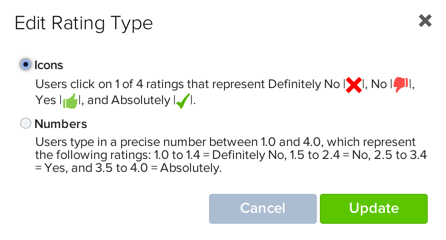 Please note that changing this setting will impact all users in your company and will change not only how users enter ratings, but also how ratings are displayed per candidate and in all reports. Once you’ve decided which Rating Type to use, click the Update button and confirm your selection. On the same Admin: Candidate Ratings page, the Ratings panel will display any Ratings that have already been created. You can click the Edit or Delete icons on the right side of each row to modify or remove these Ratings. Click the Add Candidate Rating link in the bottom left corner of the panel to create a new Rating. In the Add Candidate Rating pop-up, enter the Name and Description of your new Rating, and click Add. Ratings should be summarized succinctly in one or two words (Name) and then further described in a sentence or two that’s understandable to all users (Description). That way everyone on the hiring team is on the same page, using the same assessment criteria. 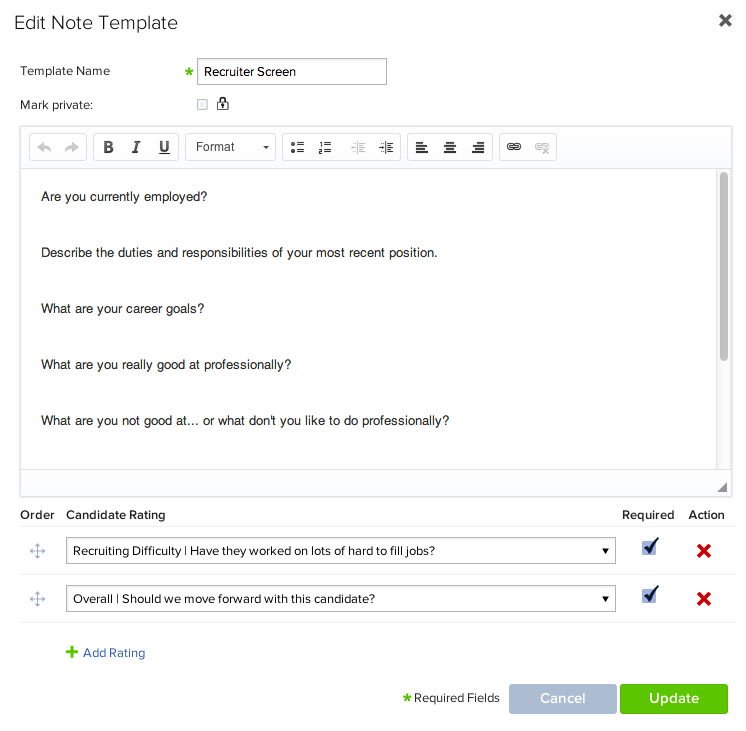 Once you’ve added all the Ratings needed by your organization, you must then assign these Ratings to Note Templates, in order for users to be able to rate candidates when entering their feedback. From the ADMIN tab menu, select Note under the TEMPLATES: sub-heading. This will bring up the Admin: Note Templates page, displaying any Note Templates that have already been created. Find the Note Template you wish to work with, and click the Edit icon to the right of the template name. This will bring up the Edit Note Template pop-up. Once you've made any necessary changes, click Update. For more information on working with Note Templates, please click here. Once the Ratings setup is complete, your users are now ready to begin rating candidates when entering their feedback. Click here for more information on how users complete Ratings.